i love when inspiration strikes! a few weeks ago i was browsing Pinterest (like we do) when i found this quilt. a tulip quilt has been on my list for awhile now, especially since I live in Holland, Michigan, home of Tulip Time. so i started sketching out a design from my inspiration quilt, but I decided to make my flower and stems curved to be more representative of the iconic flower. i laid my blocks like a field of tulips, for a nice size wall quilt. now to just figure out how the quilting!? Jess, what a great quilt. Yes tulip time is coming soon. I live just down the road in Allegan. Small world. 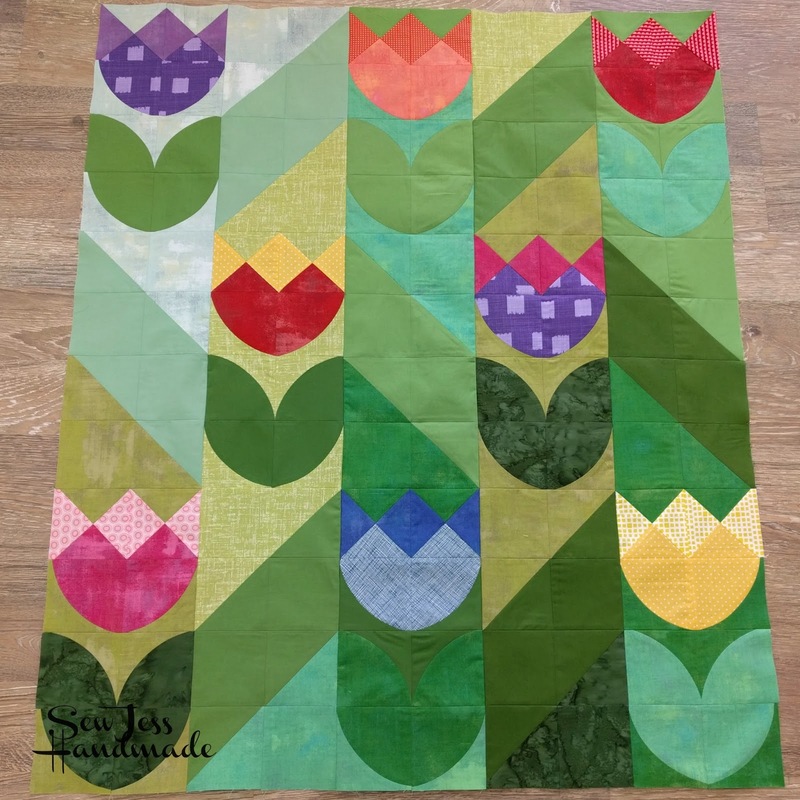 Such a happy spring quilt! That's such a cute quilt. We're still waiting for our tulips to come up here in the Pacific NW. They're running a few weeks late this year. So very cute! The tulips are lovely and the diagonal effect of the piecing really takes the whole thing up a notch. What a perfect quilt idea for someone who lives in Holland, MI! Your changes make a lot of sense...the leaves are much more appropriate now. Your color choices are wonderful! Such a beautiful quilt. Can't wait to see it finished.